After catching word of a new BBQ place called The Rub Bar-B-Que & Catering opening here in Olathe, the question was when, not if, I would go try it. Last week I finally got that chance and I figured I should spread the word on the place now that I’ve been! “The Rub” began merely as a dream of a local competitive BBQ team. A dream they continually discussed, but never got around to following up on, until 2010 when they finally got some much needed backingfrom a few investors. They next found the perfect location to move into, and the rest is a tasty (and short to this point) history that based on the early returns, will be around for awhile. If you see this place, You might want to stop. 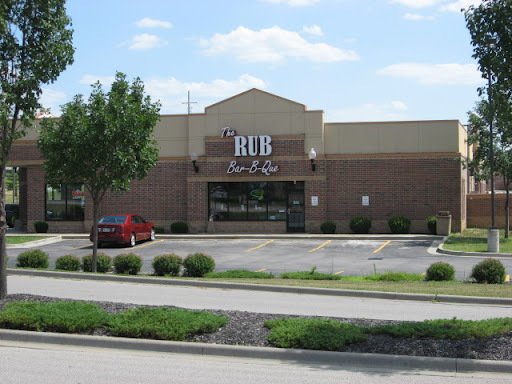 The Rub” is located in northwestern Olathe, just south of the intersection of Ridgeview Rd. and KS Hwy. 10 on the west side of Ridgeview. It is a new twist on an old Kansas City specialty. 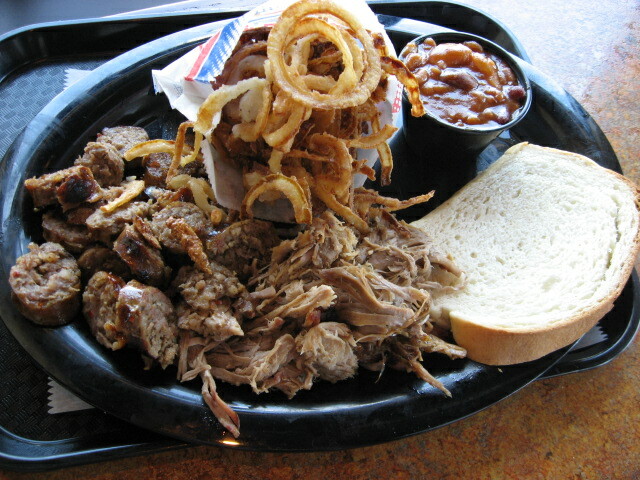 The food is just as you would expect in a KC BBQ joint, but it is a trendier, more modern version that mimics some of the “assembly line” burrito eateries that are popular these days. You walk up and order, and watch through the glass as your order is put together right before your eyes. It’s a fast-food environment that serves up “slow food” for the masses. The location and clientele demand such a fast-paced environment however, as the surrounding area contains many large offices that send workers out looking for lunch under time constraints. While on my first visit to “The Rub” I tried the “2 meats and 2 sides platter”, and I chose pulled pork and sausage as the meats. The pulled pork was very high quality. It had no large hunks of fat, and was not at all greasy. It was nothing but delicious, smoky pork shoulder. The sausage wasa little different than anything I’d ever had at a BBQ place. It had undertones of spicy Italian sausage, as it had fennel and red pepper flakes in it, but it managed to not stray too far from what you’d normally find in served in a KC BBQ eatery. The sausage looks and tastes very much like something homemade(which is a good thing) and it hardly needs sauce with all those flavors it has going on. For my sides, I had onion straws and beans, which were both very good as well. It’s got really good stuff like this- fast. On the whole, I was really impressed with “The Rub Bar-B-Que & Catering” and it’s fast-paced style of serving up an old-school meal. The environment is not going to impress everyone I realize, but if you like the general type of food, you can’t go wrong with it. I can confidently say that it won’t rub you the wrong way if you just give a try!